There is a very good chance you have already come across photos of Cappadocia and in case you haven’t we are here to introduce you to this hidden gem of a travel destination. Every morning ( Yes, every morning ) thousands of hot air balloons take to the skies over the unique landscape of Cappadocia – it is honestly a sight worth witnessing at least once in your lifetime. 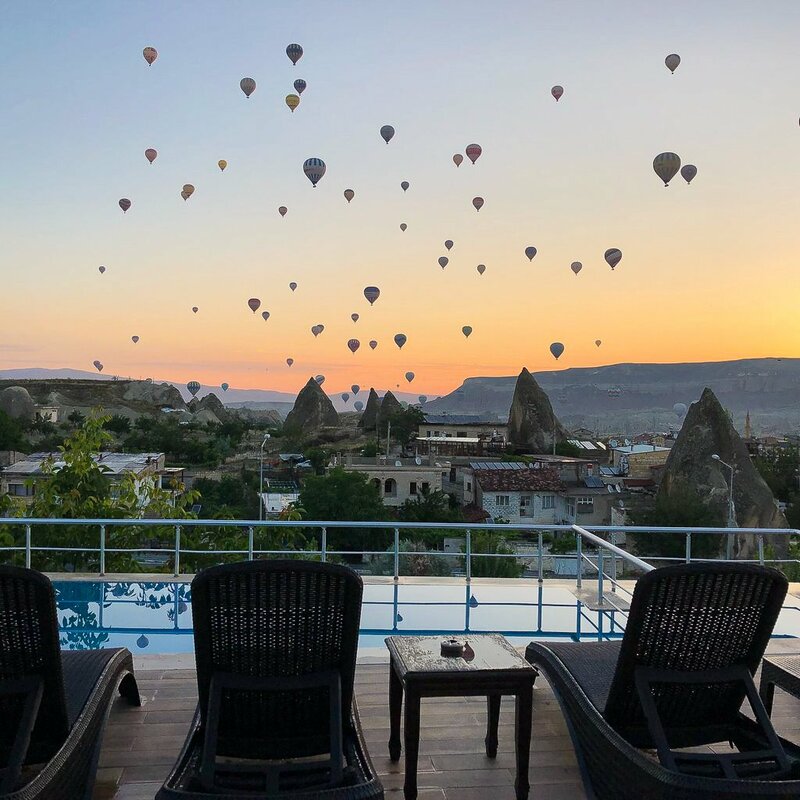 We have spent our time trying and testing hotels in Cappadocia to bring you the hotels with the best view of the balloons in Cappadocia. This enchanting hotel is situated high on the top of Aydinli Hill, which is the highest point in the town of Goreme. The location of this cave hotel in not only gives you one of the best views from the hotel in Cappadocia, but you are also treated to a spectacular view of the town with the famous fairy chimneys. You only need to step outside onto the hotel’s terrace to enjoy the wonderful sight of the colourful hot air balloons rising high up in the air. Mithra is also a cave hotel, so you can tick off staying in a cave hotel and watching the hot air balloons in Cappadocia from your bucket list. The town of Goreme is also just 5 mins walking distance from the hotel so you have the best of both worlds. 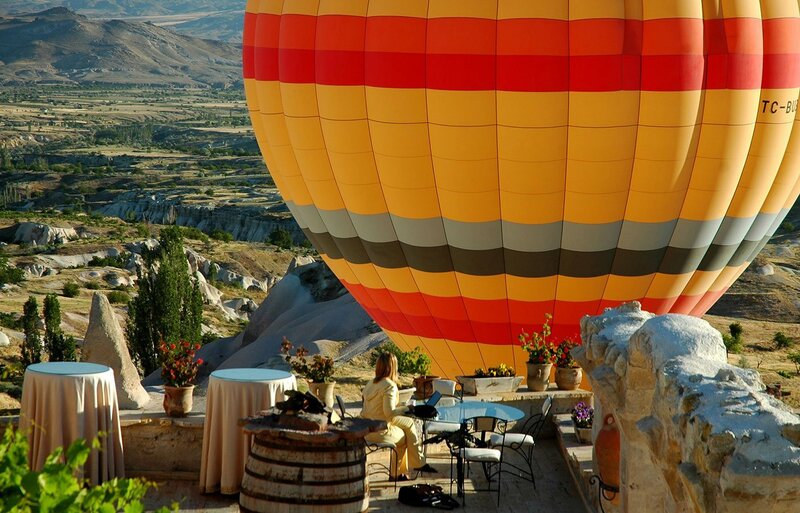 Millstone Cave Suites Hotel in Cappadocia arguably offers the best view of the hot air balloons from a hotel. 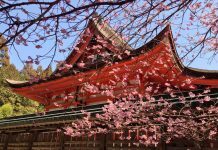 The views are so good that they do a live broadcast of this spectacle on their website on a 24-hour basis for those who do not want to miss this event. The hotel is perched on a hilltop giving you a bird’s eye view of Goreme town, Red Valley and Pigeon Valley. Each corner of the room at Millstone Cave Suites is unique, the luxurious rustically styled rooms offer a ringside seat for watching the balloons straight from your bed. This boutique hotel is situated on the edge of Çavuşin valley in the heart of Goreme National Park which is popular with balloonists. 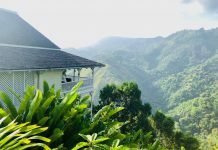 The hotel was originally an old house that has been carefully renovated, whilst still maintaining the charm and blending in the modern luxuries. 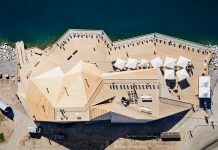 Situated close to the balloon take-off spot, you can view the balloon up close from the rooftop terrace of the hotel and marvel at this daily spectacle. It doesn’t end there for Jacobs Cave Suite in Cappadocia, the Çavuşin Castle can also be seen from the garden and the rooftop terrace is also a great spot to watch the sunset over the unique landscape of Cappadocia. 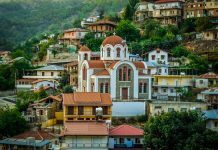 ‘Home from Home’ is what comes to mind when describing Osmanli Manor Hotel in Cappaodica. 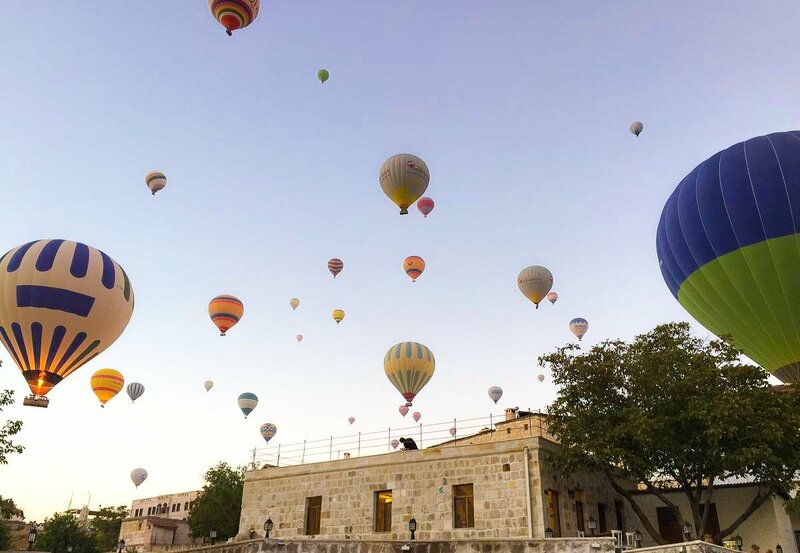 If you are looking to escape reality for a few days and experience the true Turkish hospitality along with the best view of the balloons in Cappadocia, Osmanli Manor would be a perfect choice. 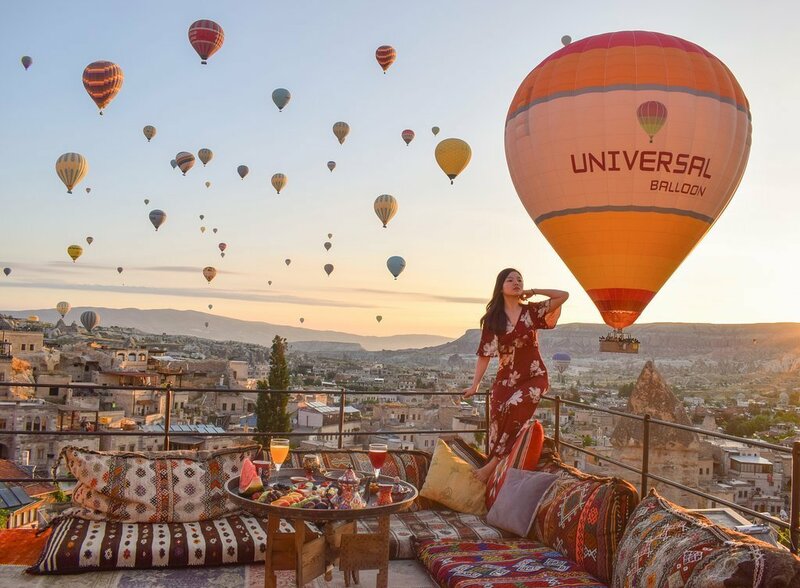 The terrace overlooks the famous Rose Valley where the hot air balloons take off from, also the hotel is located at the edge of Goreme town, so you’re away from the bustle of the town and guaranteed an unobstructed view of the balloons. Situated on a terraced hillside above the villages of Gorme, Sultan Cave Suites offers some breathtaking views from the hotel’s terrace. 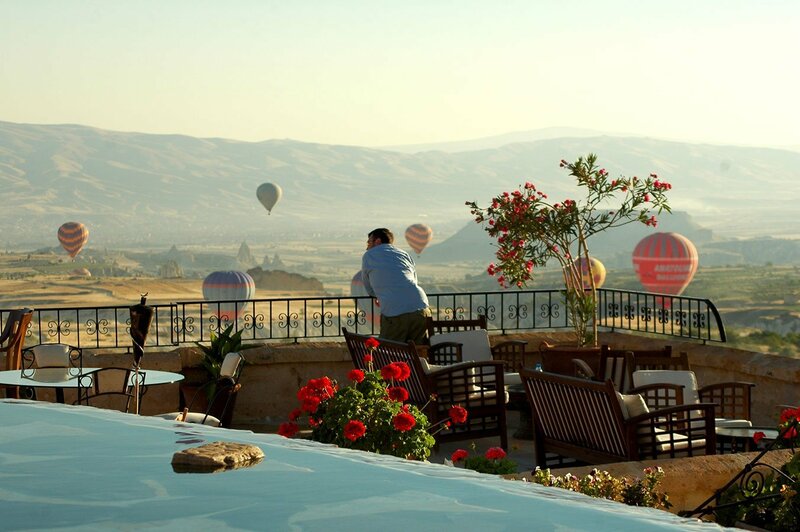 The terrace at Sultan Cave Hotel is the place to be at sunrise as the first balloons silently take to the skies. If you are lucky the hotel’s resident dog, Izmir will also join you to watch the balloons fly over the terrace. 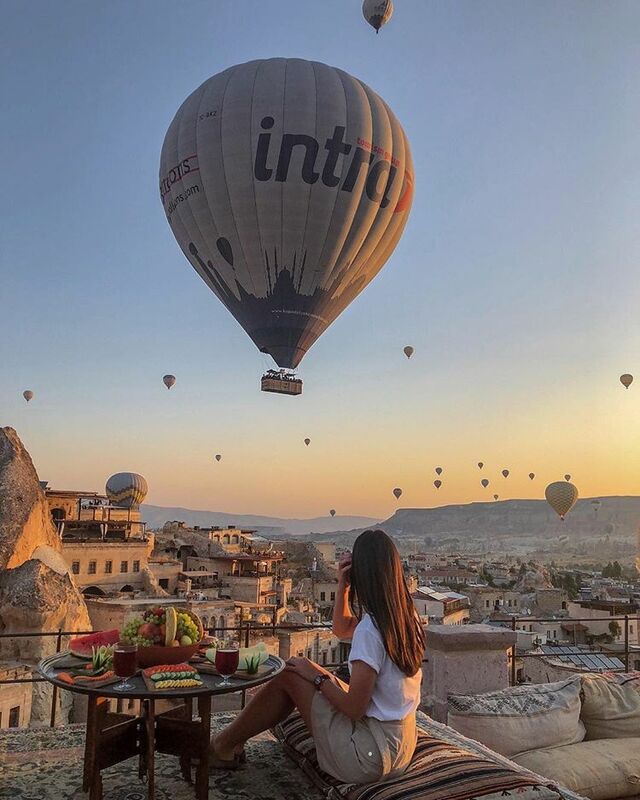 If you prefer having the view all to yourself, the Pasha suite at this hotel also offers a balcony so you can take in the view of the balloons from the comfort of your own room. 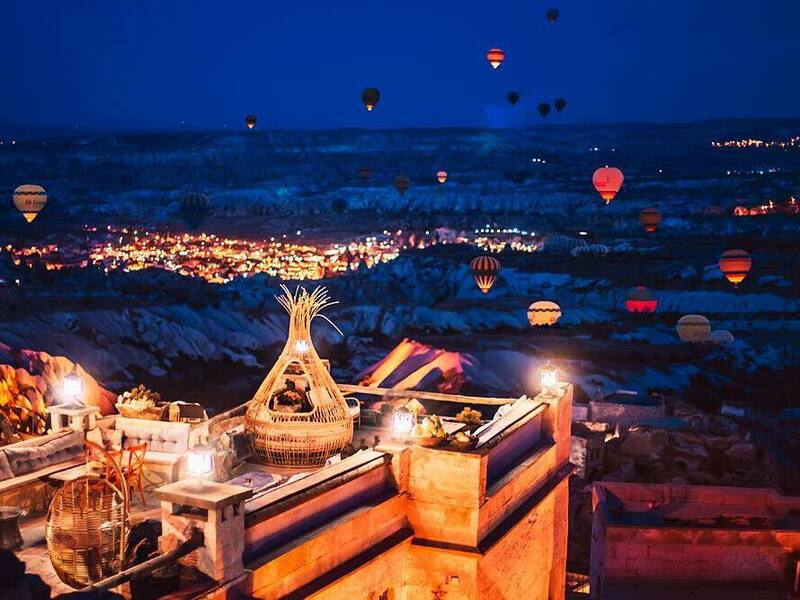 Not only is this Instagrammable hotel great for view of the hot air balloons but it also offers a panoramic view overlooking the village and surrounding valleys, mountains and the Erciyes volcano in the background. Enjoy the mystical atmosphere of Cappadocia at the one of a kind, Doors of Cappadocia. 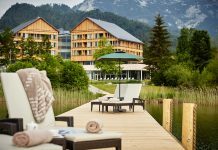 The stand out at this hotel is without a doubt the rooftop terrace – what better than to start each morning at sunrise on the huge terrace, with a large breakfast spread by the rooftop pool and to enjoy the view of the rainbow coloured hot air balloons. Set in an ancient town surrounded by Göreme National Park, everything you need is within close proximity… and after a long day of exploring what Cappadocia has to offer, return to the terrace as the sun sets for a glass of wine together. Located in Goreme, Cappadocia cave suites definitely needs a mention on the list of hotels that offer the best view in Cappadocia. Head to the terrace as the dawn breaks and watch as the first hot air balloons ascend – giving you a fantastic view of the area’s amazing geological formations. The most amazing aspect about this cave hotel is that this is the original cave dwellings from the Hittite, Roman and Byzantine periods but you can expect all the modern day luxuries. 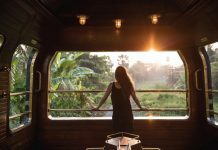 It is not just in the day time that this hotel shines by night the mood completely transforms and the cave hotel looks so enchanting bathed in soft golden lights. Tukey’s only Relais & Châteaux hotel sits in Cappadocia, not only that, as you spend some time in the hotel you will start to notice that you are in fact in a real museum, with varied varied pieces from the Ottoman, Seljuk, Roman, and Hittite periods. 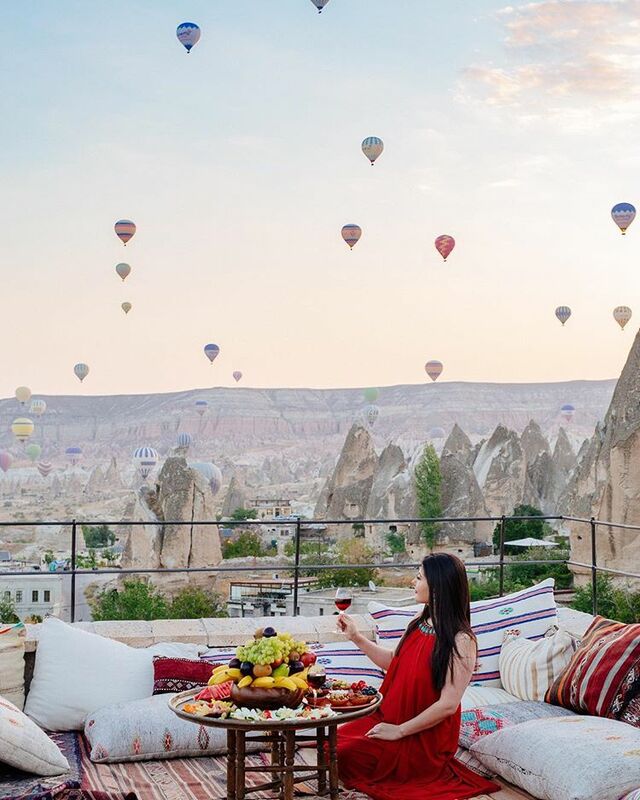 Thanks to its location, this luxury hotel in Cappadocia offers the unrivalled panoramic view of Göreme, Love Valley, Pigeon Valley, Red Valley, and Mt. Erciyes. The hot air balloons flying away in the morning can be viewed from anywhere in the hotel. 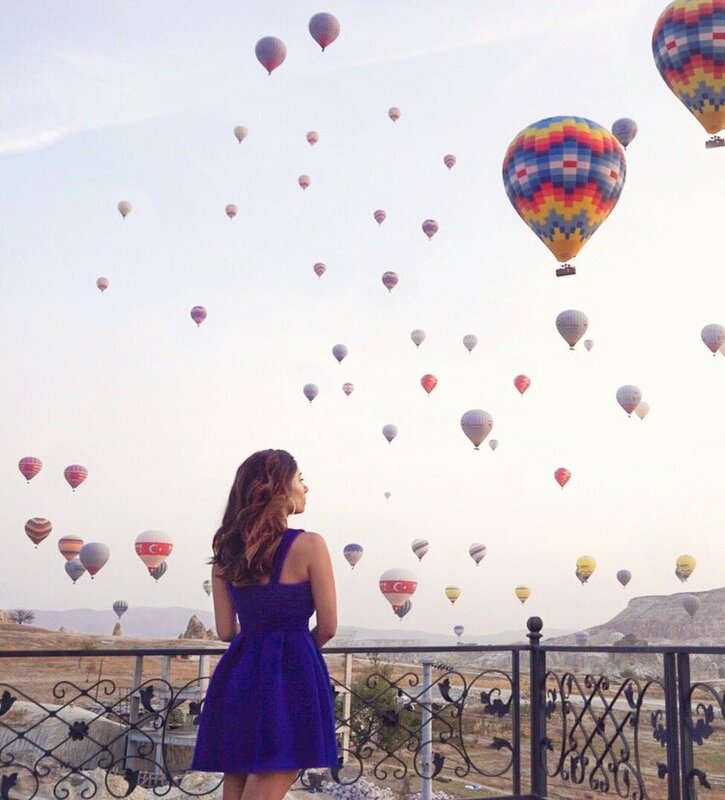 Some of the prime, spa and imperial suites offer the spectacular view of the balloons straight from your room. For something rather special, the Selale Cave Suite and Kubbeli Suite both have bathtubs offering views of the hot air balloons. Since the opening in 2014, this uniquely decorated hotel has won several awards for the views it offers. Situated right next to Uçhisar Castle, it has panoramic views of Goreme, Guvercinlik Valley and Mt Erciyes from its terraces. The hotel is an old renovated stone house with many original stone features still intact. 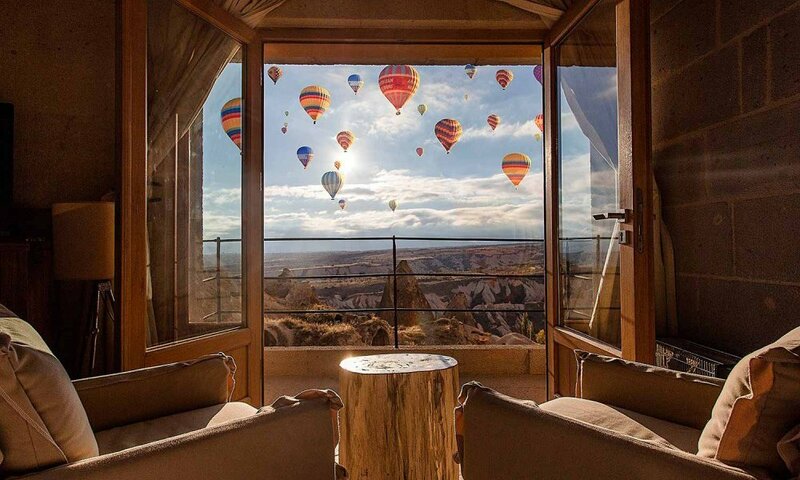 This luxury hotel is located a bit further away from the take-off point of the hot air balloons but you can see them effortlessly float by at a distance but the overall view with the valleys and the hot air balloons in the background that make the view so amazing at Rox Cappadocia.